How do I get to All Saints? We have plenty of parking at the church. For larger events there is overflow parking behind the church at the Galloway House. How will I be greeted? You will be welcomed warmly by our ushers who will shake your hand at the front door. Our ushers are there to welcome and support all visitors and they will be pleased to answer any questions and direct you to the Nave, nursery, or education wing. From the parking lot it is easiest to enter through the southwest doorway. As you come in you will go straight ahead to the Narthex and Nave. Restrooms will be on your left. You can also choose to enter through the beautiful double doors in our bell tower. The Nave will be to your right and McGlynn Hall is straight ahead. When and how long are the services? 8:30 a.m. Holy Eucharist with traditional language and hymns. 10:45 a.m. Holy Eucharist with contemporary language and blended music which combines both ancient hymns and more modern music. We also offer worship at All Saints throughout the week. Morning Prayer is held in the Light of Christ Chapel (behind the main altar) Monday through Friday at 8:00 a.m. (on Thursdays Holy Eucharist is celebrated during this time). Evening Prayer is held in the Light of Christ Chapel Monday through Friday at 5:30 p.m.
What can my kids do during worship? By all means, bring your family! If you have children from infants through 4 years of age, the Ushers can guide you to the nursery in the education wing. If you'd prefer, your children are always welcome to accompany you for worship. What kinds of disability assistance is available? Handicap parking is available by the southwest entrance of the church. Hearing Assistance Devices are available from the ushers. We can accommodate wheelchairs in the front pew on each side. How will I know how to follow the service? The Ushers will provide you with a Service Booklet as you enter the Nave. The entire liturgy is printed in your booklet. Feel free to take it with you after the service. What kinds of music will I hear? While all of our services are traditionally Anglican, our 8:30 service uses more traditional Elizabethan language and hymns are sung with an organ accompaniment. At 10:45 the language is a bit more contemporary and we use a blend of traditional hymns accompanied by the organ and more modern songs accompanied by a variety of different instruments including guitar, harp, piano, and violin. What kinds of sermons will I hear? Sermons are scripture-based, focus on practical application to daily life, and usually run around 20 minutes in length. Go to our “Sermons” page to access recent recordings. What version of the Bible is used? For worship our standard translation is the English Standard Version of the Bible. How many people will be attending with me? The Nave can seat up to 180 people for a single service. During most Sundays we average about 200 in attendance between both services. During special services, (e.g. Christmas Eve and Easter) we often have standing room only. When, and how, is Communion celebrated? We celebrate Communion every Sunday. Communion is open to all baptized believers in Jesus Christ and is celebrated with wafers and wine. The Ushers will direct each row to the altar rail. After receiving communion, please return to your seat by the side aisle. Gluten free wafers are available by request. Simply let the priest know that you would like gluten free. If you are not baptized or do not wish to receive communion, you are invited to come for a blessing; you may indicate you are not receiving communion by crossing your arms across your chest. Those desiring baptism are encouraged to speak to one of our priests. 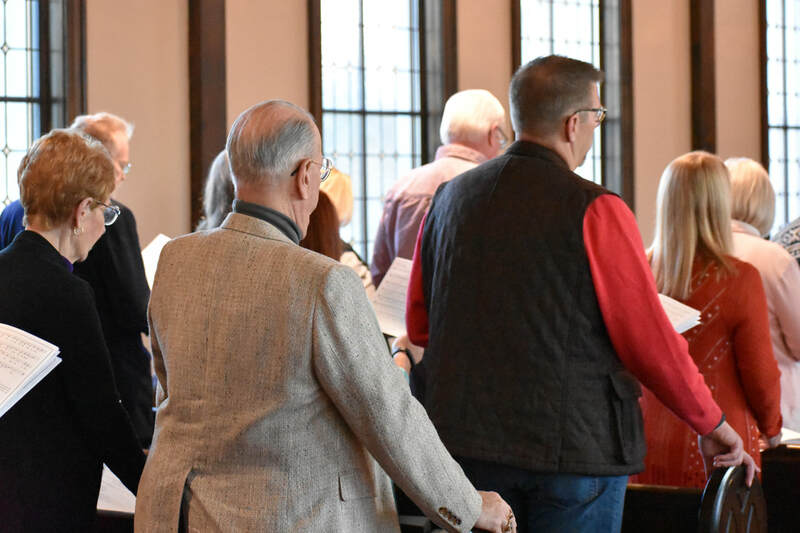 At the end of the service there is usually a recessional hymn and the priests and altar party will exit to the Narthex followed by the dismissal by the Deacon. Please join us in the McGlynn Hall for informal conversation and refreshments. After the 8:30 service we encourage everyone to stay for Christian education. Can I meet with the priest? Father Eric is available in the Narthex after the service, so feel free to come up and say hello. He would also be happy to join you for coffee during the week. You can contact Fr. Eric by clicking here. Can I just be a "quiet visitor"? Sure! When you visit All Saints, you can initiate as much, or as little, contact with others according to your own comfort level. We do not require visitors to identify themselves; however, we do want to encourage you to make yourself known when the time is right for you. You may do so by filling out one of our visitor cards which can be found at the pew and returning it to one of the Ushers or placing it in the bird bowl in the Narthex.